High yield variety combined with oriental and European type. Very wide adaptability from late summer through winter season because of its good heat and cold resistance. 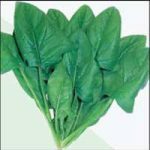 Attractive fresh green color leaves and reddish root color suitable for fresh market.